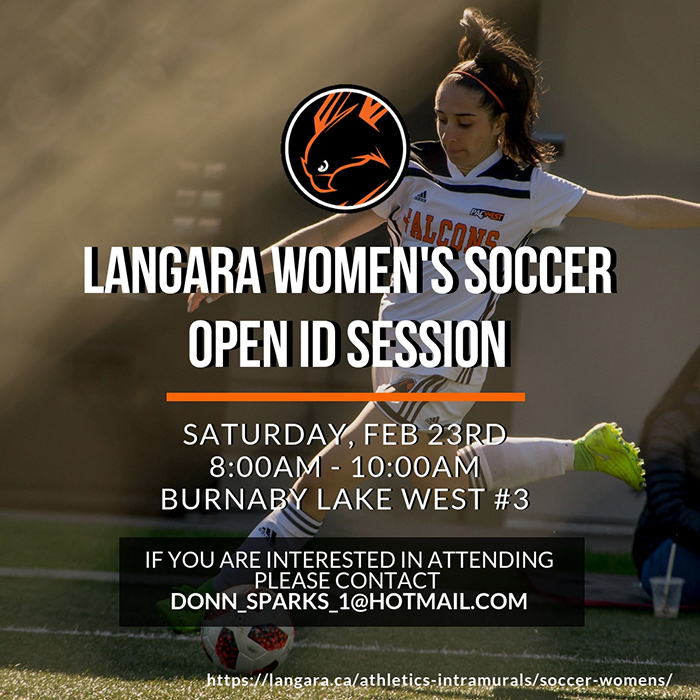 UPDATE: Our Women's Soccer ID Session for this Saturday, Feb 23rd at Burnaby Lake West #3 has been moved indoors to the Langara College Gymnasium due to field closures. Congratulations to the Falcons named to the PACWEST All-Star team. 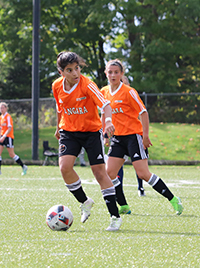 The Langara women's soccer team were able to get a split in their doubleheader with Douglas College over the weekend. On Saturday the Falcons's fell behind early, finding themselves down by three goals after 20 minutes. The compete level remained high for the rest of the match, with the Falcons generating chances and holding the bulk of pocession in the second half, but they were unable to beat Douglas' goalkeeper and ended up failing 4-0. On Sunday the Falcons' came out looking for some redemption and were able to take it to the Royals. 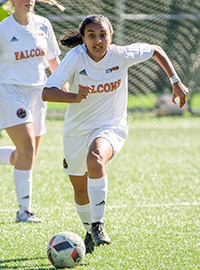 In the fortieth minute #14 Nicole Bell was able to get the Falcons only goal of the weekend. THe teams continued to exchange chances but neither had very high quality scoring changes. The Falcons were able to get the 1-0 victory. 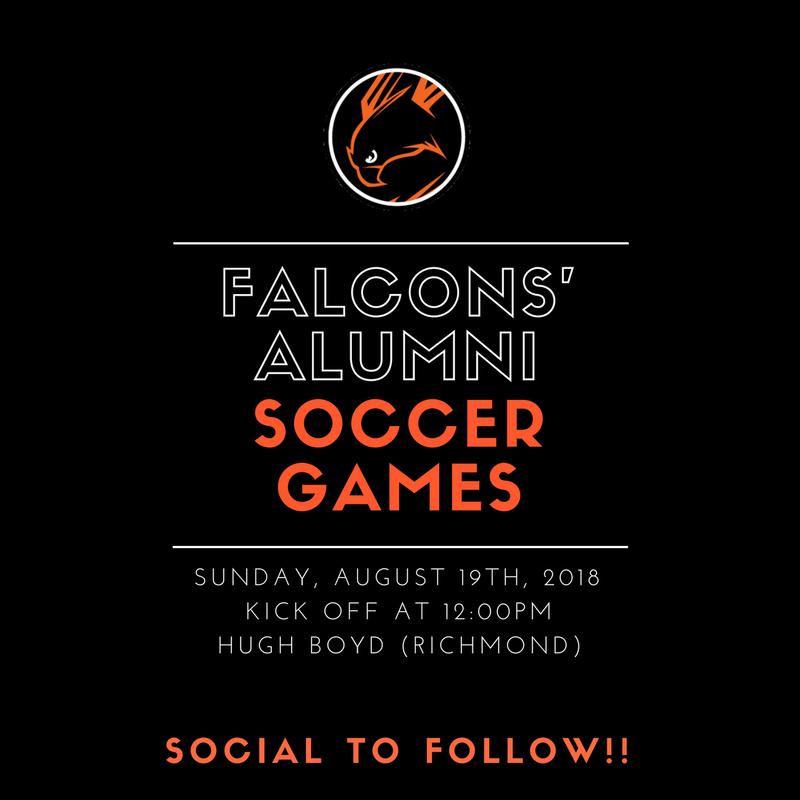 The Falcons are now headed over to VIU on Saturday to try to get their first win against the Mariners after drawing in their two previous matches this season. 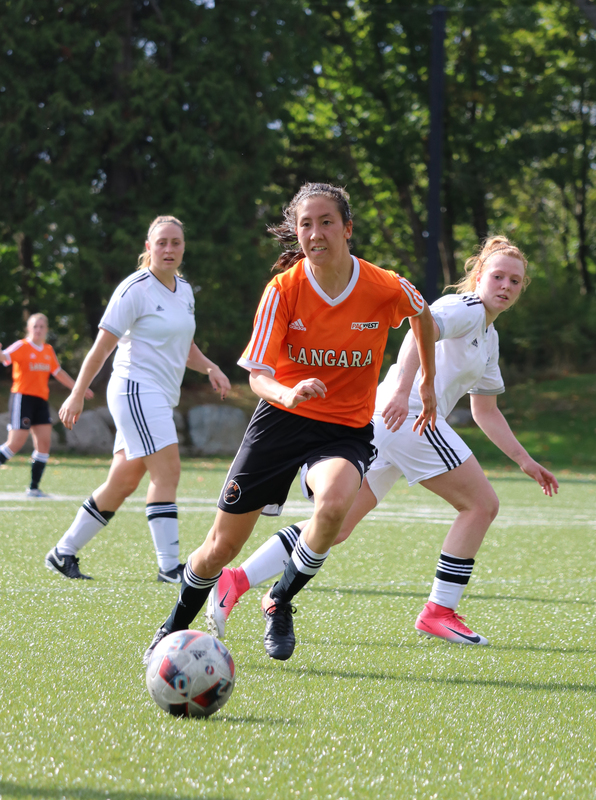 Kayla comes to Langara from Sir Winston Churchill Secondary. 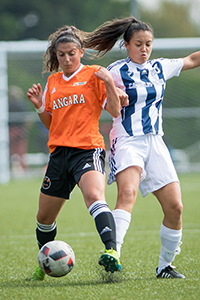 Kayla is a holding midfielder who has most recently been playing for the TSS Academy in the Metro Women's Soccer League. Her speed and physicality are two of the many positive attributes she possesses. Kayla is a very composed player who also makes inteligent decisions on the field and because of this makes players around her better. Kayla will be an immediate asset to our program. 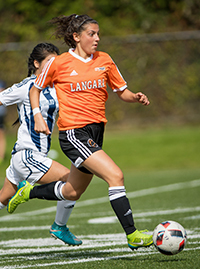 Ritti comes to Langara from Ecole Panorama Ridge Secondary and is currently playing outside back for Total Soccer Systems Academy in the MWSL. She has quick feet, is deceptive, and is very confident on the ball. Ritti anticipates the play very well defensively which enables her to become a threat immediately offensively and will be able to impact our team's transition both ways. Ritti's work rate and skill level will be invaluable to our program, she brings a positive attitude and will lead by example. It's our pleasure to welcome our third player from Total Soccer Sytems Academy. 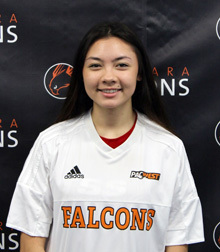 Zoe comes to us from Burnsview Secondary and plays the game with a passion that all her teamates and opponents will notice. Her incredible work ethic is only matched by the enjoyment she has playing soocer. Zoe is a fantanstic student of the game and will bring an energy level that any program would be lucky to have. She is eager to make a big impact immediately both offensively and defensively. Langara is fortunate to welcome Zoe to our school and program. 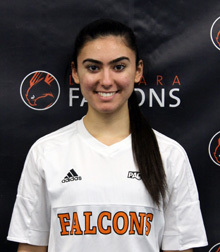 The Langara Falcons are excited to welcome back alumna Rachael Pelat as head coach of the women’s soccer team. Pelat was a league all-star multiple times when she played for Langara for three seasons, 2004-2007. She was the Canadian College Athletic Association (CCAA) Player of the Year in 2006, leading Langara to their second consecutive national championship. Pelat’s first order of business this off-season is getting the team together more frequently, planning identification camps for incoming players, and recruitment for the 2017-18 season. 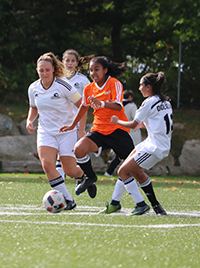 The Falcons finished 6-4-2 last season, losing to the Capilano Blues in the PACWEST Provincial Soccer Championship bronze medal game. “I am excited to get out there and find additional talent to add to the group. It’s important to me that the student-athletes that come through the program have similar successes, opportunities, and experiences that I did when I was here,” she said. 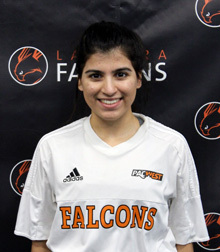 In her three seasons with the Falcons, Pelat earned numerous individual awards and lead Langara to the CCAA championship in 2006 and 2007. In 2006-07, she was named a British Columbia Colleges' Athletic Association (BCCAA) 1st team all-star, BCCAA Female Athlete of the Year, named to the National Championship All-Tournament Team and the CCAA Player of the Year. Sport BC recognized her as the College Athlete of the Year in 2006. 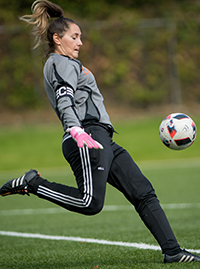 Rachael has spent time coaching over the past decade with Surrey United SC, Coquitlam Metro Ford SC, and most recently at Douglas College where she has assisted with the women's soccer program since 2011.